- Keep your sponge, scrubby and drain stopper right where you need them. - Countertops stay clear - no more mess around the kitchen sink. - Open design allows water to drain, so sponges and scrubbers quickly air dry. - Storage suction sponge holder sink caddy stays on with a powerful suction. - This compact soap and sponge drying rack holder is also perfect for adding extra storage, like your home, cabin, apartment, condo, RVs, campers and more. Keep your sponge, scrubby and drain stopper right where you need them. Countertops stay clear - no more mess around the kitchen sink. Open design allows water to drain, so sponges and scrubbers quickly air dry. 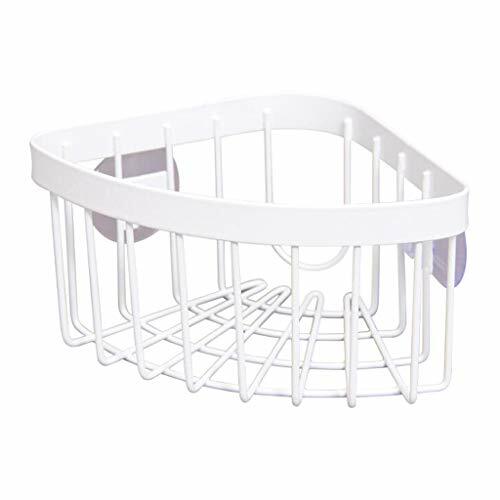 Storage suction sponge holder sink caddy stays on with a powerful suction.